.Since 1964, Camp Osage (originally the main camp) has been welcoming Scouts to the banks of the South Fork River. 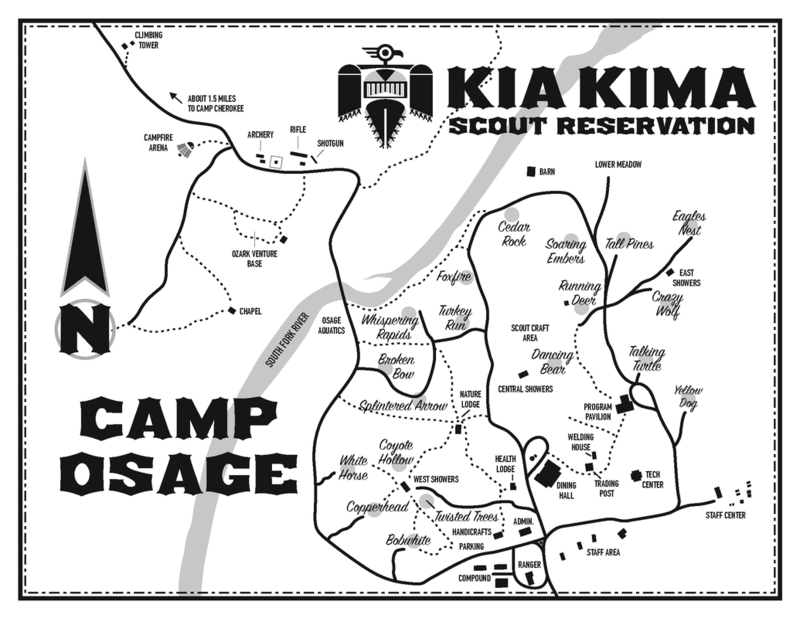 Camp Osage is the larger of the camps at Kia Kima Scout Reservation, with 18 fantastic campsites. At Camp Osage, a troop will find traditional, though exceptional, camp programs including Nature, Scoutcraft, Handicraft, Shooting Sports, the Trailblazer 1st-year program, Aquatics, and S.T.E.M. programs. All aquatic activities, including swimming and boating, are held at the Osage waterfront on the South Fork River. All meals in Camp Osage are served in the new Dining Hall that opened in 2015! Want to come to Kia Kima, but your troop is going somewhere else? Learn how to attend on your own, with provisional camping!